NASA's Mars rover Curiosity has photographed a shiny, metallic-looking object that bears a passing resemblance to a door handle or a hood ornament. The Curiosity rover has not stumbled onto evidence of an ancient civilization that took the family van to Olympus Mons for vacation, however. The object is simply a rock that the wind has sculpted into an interesting shape, scientists said. "The shiny surface suggests that this rock has a fine grain and is relatively hard," Curiosity scientists wrote Monday (Feb. 11) in an explainer blurb accompanying the image, which was taken on Jan. 30. "Hard, fine-grained rocks can be polished by the wind to form very smooth surfaces." A close-up of a shiny, wind-sculpted rock photographed by NASA's Mars rover Curiosity on Jan. 30, 2013. Similar "ventifacted" (wind-eroded) rocks can be found here on Earth, notably on the dry, gusty plains of Antarctica, they added. 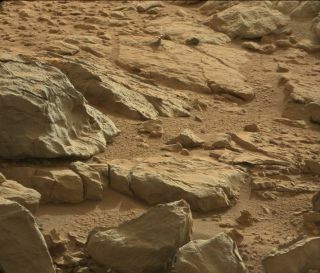 The newfound rock is not the first shiny object Curiosity has photographed on the Red Planet. In October, the car-size rover paused its first soil-scooping activities to investigate a bright sliver lying on the ground nearby. Scientists think the scrap is a piece of plastic debris that shook loose during the robot's dramatic sky-crane landing on the night of Aug. 5. Later in October, Curiosity spotted bright flecks in one of the holes it dug out while scooping. That material appears to be some sort of native Martian mineral, as does the so-called "Mars flower," which garnered a lot of attention after Curiosity photographed it in December. While such finds may be be interesting to laypeople and researchers alike, Curiosity has bigger fish to fry. The rover's main task is to determine whether its landing site — a huge crater called Gale — could ever have supported microbial life. Curiosity carries 10 different scientific instruments and 17 cameras to aid in this quest, along with other tools such as a rock-boring drill. Curiosity used this drill to collect samples for the first time over the weekend, boring 2.5 inches (6.4 centimeters) into a Red Planet rock in a move that had never been done before on another planet.